In tidying up some of my blog infrastructure today, I came across a short post that I wrote in 2007 but had not published, so I'll go ahead and share it now. 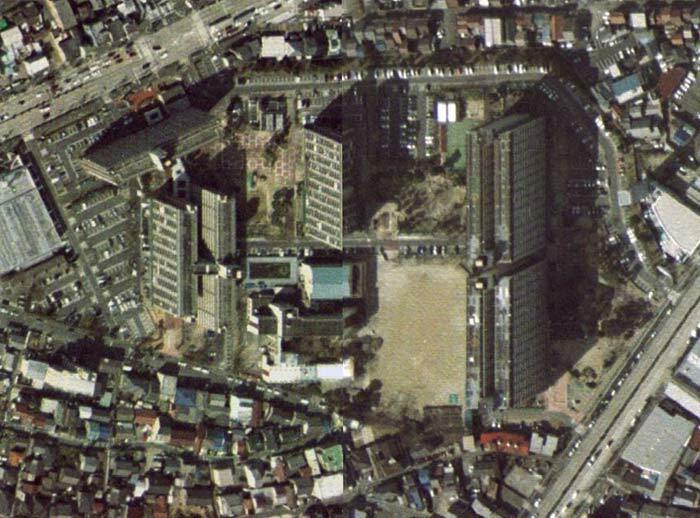 I'm used to the sometimes-odd views one sees in Google Maps due to differing photos being stitched together or other random oddness, but sometimes the final effect still gives a startling vertigo-like effect, as in the snippet above from Nagoya, Japan. The snippet above was captured in 2007. The current Google imagery for that location also exhibits multiple different perspectives in very close proximity, though the effect is not as pronounced as before. The stitching is first class... I don't see where they stitch the images together, but I wonder why they would do it on a building-by-building basis. If the images are from a satellite, there seems to be at least three different perspectives, though it's possible the images are from a low-flying plane, in which case maybe there are only two perspectives. Hard to tell. The story of Google Maps from start to finish would be a fascinating read. I think these are indeed aerials, not satellite pics. Zooming a LOT in Google Earth will show you some stitch lines. But it’s a pretty good job indeed! A couple of recent articles on that topic that I found interesting: How Google Builds Its Maps—and What It Means for the Future of Everything from The Atlantic and What Makes Google’s Maps So Good from The New York Times. Also fascinating is The Forgotten Mapmaker: Nokia Has Better Maps Than Apple and Maybe Even Google from The Atlantic.